Fig. 3. 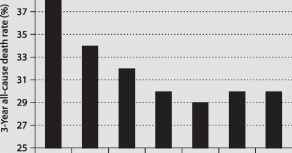 Year 2000 percentage of incident renal replacement patients with diabetes as the primary diagnosis according to national registries. Modified with kind permission from Prof. Lo-catelli. infection of the bloodstream access routes or both. All had further visual deterioration. Neuropathy was not accelerated. Muscle wasting, hypoproteinemia, and fluid overload were common. Dialysis for such patients may be considered as a palliative measure with little likelihood of long-term survival or improvement in quality of life. Four of their patients were male, 3 female, and the age ranged from 26 to 49 years. The duration of proteinuria was 1-5 years. It is evident that the problems facing diabetic ESRD patients are still the same, maybe with less ophthalmo-logic problems but more atherosclerotic cardiovascular disease (CVD) and congestive heart failure. 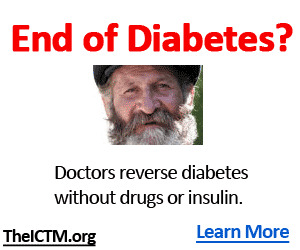 This was the fate of a diabetic ESRD patient in a developed country such as the USA in the early 1970s. There is no doubt that in those days there was no hope even for non-diabetic ESRD patients to have access to dialysis treatment even for one day in many countries. Certainly at present we are equipped with much better technology, medications and understanding of the pathophysiology of the disease, but still we have a long way to go in order to achieve more ideal outcomes for diabetic ESRD patients. The situation for all ESRD patients was the same until the passage of public law 92-603(HR1) which allowed the federal government to fund the treatment of approximately 85-90% of Americans with ESRD. Approximately 13,000 patients were being treated by intermittent hemodialysis and 200-300 by peritoneal dialysis when the law became effective in July 1973. Additionally, about 2,400 patients/year received kidney transplants. Publicity related to passage of the bill resulted in a large influx of new patients. The potential impact of the law is put into perspective by envisioning 10,000 to 13,000 new patients entering treatment each year . Nevertheless, 9 months after passage of the law, July 1973, many serious difficulties in implementation remained. In his article discussing the major unwanted effects of hemodialysis treatment in all patients, Ginn [ 10] concluded that major problems remained regarding: (1) nutrition; (2) hypertension; (3) anemia; (4) bone disease in uremia; (5) pericarditis; (6) blood access; (7) hemodialysis equipment, and (8) water treatment in hemodialysis. These statements are contrary to our understanding today. Anemia is not tolerated by the medical community. Regardless of the benefit of 2,3-DPG no one will accept hyperphosphatemia, and the recommendation is to bring serum phosphate down to normal for many different reasons including secondary hyperparathyroidism which can by itself adversely effect anemia. The use of androgen is not recommended, and finally, currently ac-idosis is considered very harmful and bicarbonate dialy-sate is the ideal solution for patients on dialysis. clinical trial were published that erythropoietin therapy became clinically relevant . Up to that time 25% of 150,000 ESRD patients on dialysis required intermittent red cell transfusions . It is easy to assume that those patients would have developed unwanted events such as blood-borne infections, hepatitis, iron overload, further bone marrow suppression and HLA antigen sensitiza-tion. Considering the above-mentioned facts, one can imagine how much the fate of diabetic patients has been under constant change in the dialysis unit since 1970. Today diabetes is the most common global cause of chronic kidney disease (CKD), present in one fourth to two thirds of all patients with renal impairment [4, 16]. Anemia is more severe in diabetic ESRD patients and 2-3 times more prevalent in diabetics with CKD and ESRD than in non-diabetics with the same degree of renal impairment . It has recently been recognized that in diabetic patients anemia is seen not only in preterminal renal failure, but frequently also in patients with only minor derangement of renal function . A major cause of anemia is an inappropriate response of erythropoietin to anemia. Additional factors are iron deficiency and iatrogenic factors, e.g. ACE inhibitor treatment. Because most of the late complications of diabetes involve isch-emic tissue damage, it would intuitively be plausible that treatment with human recombinant erythropoietin should be beneficial to ESRD patients. With regard to the question of the management of anemic patients with DN, there is not sufficient evidence from controlled clinical trials to come up with a satisfactory answer. The question remains whether correction of anemia with erythropoietin treatment is beneficial with respect to diabetic end-organ damage in patients with diabetic ESRD. The new KDOQI anemia guidelines published in May 2006 define anemia as a Hb of <13.5 g/dl for males and <12.0 g/dl for females and a target Hb of 611 g/dl with caution when intentionally maintaining Hb at >13 g/dl. For target iron stores, the recommendation is a TSAT of at least 20%, and a lower ferritin limit of 200 ng/ml in HD-CKD and 100 ng/ml in non-HD-CKD . A ferritin level of >500 ng/ml is not recommended. Adjuvant therapy such as L-carnitine and ascorbate are not routinely recommended because of low quality evidence, lack of efficacy, and also safety concerns regarding ascor-bate. Androgen use is not recommended as current guidelines reflect serious safety concerns. 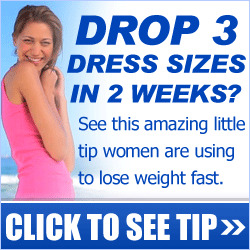 Evidence for efficacy is low quality. A hyporesponse to an erythropoiesis-stimulating agent (ESA) and iron therapy can occur. The patient with anemia and CKD should undergo evaluation for specific causes of hyporesponse if the Hb level is persistently <11 g/dl, and if the ESA dose is equivalent to epoetin of >500 IU/kg/week. Factors most commonly associated with persistent failure to achieve target Hb levels for at least 6 months despite ESA therapy include persistent iron deficiency, frequent hospitalization, hospitalization for infection, temporary catheter insertion, permanent catheter insertion, hypoalbuminemia, and elevated C-re-active protein (CRP) levels. Other contributing factors include pancytopenia/aplastic anemia, hemolytic anemia, chronic blood loss, cancer, chemotherapy, or radiotherapy, inflammatory diseases, acquired immune deficiency syndrome, and infection. Nowadays susceptibility to infection is more common in countries where the dialysis dose is less than the recommended dose of the HEMO study . Financial restrictions and a shortage of manpower and equipment especially in diabetic ESRD patients play a role in the susceptibility to infections. In dialysis units in developed countries, tuberculosis has been reported in immigrants from endemic areas; this is especially more common in DN . Except in patients suffering from HIV and ESRD, more efficient dialysis and as a result better nutrition has decreased the incidence of TB in diabetics in the dialysis unit. Fig. 4. Raw unadjusted mortality rate. Fig. 5. 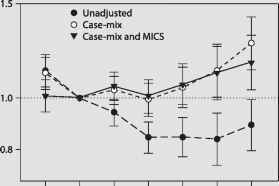 Mortality rate adjusted for case mix and malnutrition-inflammation complex syndrome (MICS). than in non-diabetic patients (32.2%). Much of the cardiac pathology is acquired even prior to establishment of end-stage renal failure . In another study about causes of death among patients with ESRD, 84 diabetic and 74 non-diabetics were evaluated by coronary angiography. Triple vessel coronary artery disease was significantly more common among the diabetic subjects (27 vs. 12%, p = 0.005) . Glycemic control appears to impact the survival of diabetic ESRD patients. In a study investigating 150 diabetic ESRD patients, it was found that good glycemic control (HgbAlc <7.5%) predicted better survival [ 29]. In order to determine the optimal target for glycemic control in diabetic dialysis population, the DaVita national dialysis database was analyzed. Of 82,933 patients undergoing MHD in DaVita outpatient clinics over 3 years, 26,187 MHD patients had HbAlc measurements at least once. Raw mortality data revealed that lower HbAlc values were associated with higher all-cause mortality rates (fig. 4); accordingly, unadjusted survival analyses indicated lower death risks in MHD patients with higher HbAlc values. Similar findings were noted with cardiovascular death. However, after adjusting for potential confounders including case-mix, age, gender, race, dialysis vintage and dose, comorbidity, and surrogates of the malnutrition-inflammation complex syndrome (MICS), HgbAlc values of >8% were incrementally associated with higher all-cause and cardiovascular death risk. The authors concluded that the greatest survival was observed with HbAlc of <8% (fig. 5) . Diabetic ESRD patients on dialysis respond to insulin differently. The risk for hypoglycemia increases during hemodialysis sessions. The compensatory homeostatic response to hypoglycemia may increase the risk of abnormal blood pressure regulation. Similarly, if glucose-free dialysates are used, then diabetic patients may become hypoglycemic, as insulin is not removed during dialysis and there may be an inappropriate neuroendocrine response  . In a randomized, placebo-controlled, unblinded, cross-over study of 44 hemodialysis patients, 34 patients without diabetes and 10 patients with diabetes were allocated to treatment with and without glucose in the di-alysate during two 10-week periods. Blood pressure and blood glucose levels were determined 5-8 times in each dialysis session during both periods. Systolic and dia-stolic blood pressures decreased with glucose in the di-alysate in patients with ESRD, presumably because of insulin-induced vasodilatation in patients without diabetes. Blood glucose level regulation improved in the diabetic subgroup, and blood glucose levels were not greater in patients with diabetes with glucose in the dialysate . Advanced glycation end products Others: leptin, bicarbonate of MICS. Components of reversible epidemiology are shown in table 1. There are many different intradialytic and interdia-lytic complications that diabetic ESRD and ESRD patients have, albeit occasionally they are more pronounced in diabetic ESRD patients. Adverse cardiovascular effects of hyperphosphatemia may be more extensive and severe in diabetic ESRD patients because of the unwanted effects of nephropathy on the cardiovascular system prior to the establishment of ESRD. The well-being of diabetic patients is greatly influenced by diabetic foot disease. In one report, diabetic foot disease resulted in amputation of lower limbs in 14% of ESRD patients . The association of diabetic foot lesions with advanced DN may be explained by the long duration of diabetes, macroangiopathic and neuropathic complications or a combination of both . Another major determinant of the fate of diabetic ESRD patients includes hemodialysis equipment. In the early 1970s approximately 50-55% of patients were being treated by coil dialyzers, some 25-30% by parallel plate units, and about 20% by hollow fiber capillary dialyzers . At present, dialyzers are more biocompatible and efficient with lower capacity facilitating more efficient dialysis in comparison with the past . Fig. 6. 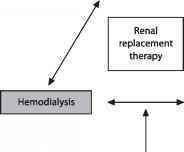 Different modalities of renal replacement therapy. 68 patients with DN and 66 non-diabetics. The mortality was 52.9% in diabetic patients. Survival seems somewhat better because of the selection criteria . The adequacy of dialysis and the decrease in nutritional status may also be contributors to the worse outcome in diabetics. Diabetic patients appear to be more sensitive than non-diabetics to inadequate dialysis prescriptions. The morbidity associated with insufficient dialysis in diabetics may be mediated through anorexia, leading to decreased caloric and protein intake. 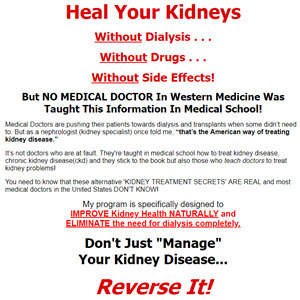 Death by withdrawal from dialysis is also more likely to occur in diabetics. MHD is the most common dialysis modality used worldwide [ 2]. For many reasons, different modalities may be more ideal for different patients. In a national cohort study of 1,041 patients starting dialysis (274 patients receiving peritoneal dialysis and 767 patients receiving hemodialysis at baseline) it was concluded that the risk of death in patients with ESRD undergoing dialysis depended on dialysis type . It has been suggested that short daily hemodialysis will improve the quality of life, rate of hospitalization and mortality . It has been suggested that home daily nocturnal hemodialysis may have the highest survival for diabetic patients on MHD . Nocturnal hemodialysis offers a high dose of dialysis, improves biochemical parameters and quality of life. Despite the significant losses, in a study of 24 patients under daily nocturnal hemodialysis, protein malnutrition was not seen. Most of the patients were anabolic . Further studies are needed to see how short daily hemodialysis or daily nocturnal hemodialysis affect diabetic ESRD patients. Finally, it has been suggested that the different modalities of RRT should be complementary and not competitive. For this reason an integrative care approach is necessary for ESRD patients whereby, when appropriate, patients are started on peritoneal dialysis, followed by kidney transplantation whenever possible and transferred timely to hemodialysis when peritoneal dialysis-related problems arise. This approach would perhaps enable us to make use of the entire RRT arsenal (table 2 ; fig. 6) .